In training sessions I often ask participants the same question. I ask them to imagine that they are running a retail store and they have spared no expense. The signage is perfect, the shelves are well stocked and the assistants they have employed are professional and courteous. Then I ask them to imagine that their store is based in the middle of nowhere. Most people’s websites are like that – they invest in making it look great but don’t promote it. It therefore doesn’t attract any visitors / customers and is therefore a complete waste of money. Most small businesses say that their website doesn’t generate any business so is a waste of time. Their website is probably fine, but no thought has been given to promotion. Here are some quick tips to promote your website; but don’t worry, if all this seems daunting, table59 is launching a website promotion service to do this for you. – If you are a local business make sure you register with Google Places. – Submit your website to Google and Bing (at least). – Submit your website’s Site Map. – Read and reread my blogs on discovering and deploying your Google keywords. – Install Google Analytics to track how many visitors you are receiving and what they look at on your site. These activities will have an immediate impact on the promotion of your website with Google, but let’s not forget that Google is only part of the promotion story. 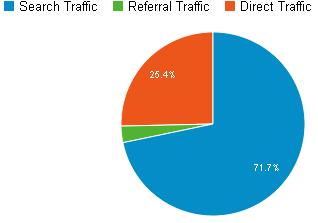 As you can see from the following chart visitors are attracted to your site from Referrals and Direct Traffic – what are these and how can you improve traffic from these sources? Referral Traffic relates to visitors who clicked on a link on another website or email to come to your website. Increase this by making sure you place links to your website on your emails, Facebook Page and on any business directories you are registered with. Google Places is a business directory and will show up as Referral Traffic in your Analytics. Direct Traffic relates to visitors who happen to remember your website address and type it directly into their web browser (e.g. Internet Explorer). Increase this by making sure your website address is on all your stationery and any other direct promotional items that you produce. I understand that this might seem a bit too complicated, but it really is important and therefore worth the effort. Put simply, forgetting to promote your website is just like locating it in the wilderness where no-one is able to find it. If you would like to discuss how table59 can help you to promote your website, just contact us. In last week’s blog I explained how to build your keyword list – i.e. the words and phrases that Google will use to rank your website. We reviewed the process of determining which keywords to choose based on the Google Keyword Tool, which tells us how many people have searched for those phrases. Missed last week’s blog on building your keyword list? – no problem – click on the link to read it. So you followed the instructions from last week’s blog and you have your list of keywords – now let’s look at how to use them to maximum effect on your website and elsewhere. A few years ago I recorded a video on finding and deploying keywords. While the technology has moved on, the basic steps are still the same – the video is in the head of this blog. On-Page refers to deploying your keywords on the website itself. You will have some keywords that are main (or focus) keywords that are the most important to your business. These keywords should command their own web page; in fact, they should be deployed on a blog item (like the one you are reading now). Over time you can write a blog item for most of your keyword list to make sure Google indexes the website correctly. As an example we are going to use the keyword, “solicitors belfast”. As you can see from the following image taken from the Google Keyword Tool, this keyword is searched for by almost 10,000 people every month. It is recommended that the keyword appears a number of times in the text of the page, but not too many times (keyword stuffing can be penalised by Google). Approximately 250 words of text on the web page is perfect with the keyword appearing about 5 times on the page. Place the keywords in the headings and make sure they feature towards the top of the page as much as possible. – In the meta-title and meta-description of the page. If you need help with this bit please let me know – you might have spotted these terms in your Content Management System and that’s where the keywords need to go. Off-Page refers to placing your keywords on other sites which link to your website. Examples of such sites are Business Directories (e.g. Google Places, Chamber of Commerce directory), a links page on someone else’s website, a Facebook Page or online advertisement. Google will reward you through improved ranking if another (higher ranking) website links back to your website using the keywords that you have chosen. But what does that mean and how do you do that? Hover over the following link and read the text that pops up – example link. You want to make sure that your links on other sites have that link text (anchor text) inserted. That is done via the Content Management System and is very straight-forward to do – you will likely have noticed it before – if you need any help please let me know. In this blog we have covered a lot of information but it’s worthwhile to take the time to understand it. Armed with our keyword list we have learned how to deploy on our web pages and through links on other sites. I strongly recommend starting with one keyphrase and following these steps before attempting more phrases. You will learn from starting slowly and hopefully not becoming frustrated. Of course, if you need help with any aspect of this please do not hesitate to contact me. Finding out which keywords prospective clients type in is not difficult. Simply use a free online tool provided by Google called the Google Keyword Tool to try out some keywords. This tool will tell you how many people are searching for these keywords in your target location every month and how much competition there is for those keywords. How to Use the Google Keyword Tool? – Competition: This is High, Medium or Low and relates to how many other websites are competing for Google ranking for that search term. – Take a note of the most appropriate keywords for your business. It might be best to steer off the high competition keywords from this tool as it will be quite difficult to rank on Page One of Google for these. Best to target the medium or preferably low competition keywords, which will likely require some lateral thinking on your behalf! OK – so I’ve got my keywords – what do I do with them? Armed with your keywords (have one main keyword and a few related keywords) then it’s a matter of deploying them on your site and elsewhere. This is a topic which could stretch to many many blog posts so I’ll write another next week to detail the process. For now, conduct your keyword research and build your list. Then watch this space for the next steps. If you would like any help understanding this please contact me. Last year we had a client featured on an episode of Farm Fixers on BBC2. I watched the website statistics grow over the 30 minute programme and noted that the vast majority of visitors were using their mobile phones to view the client’s website. They were watching the TV with their phones in their hands, surfing the Internet. I suspect that some of us do exactly the same thing. Okay, so we need a mobile website, but what does that mean and how do we achieve it? Most people get mixed up between a mobile-friendly website and an App that they download from the Apple or Android App Store. A mobile friendly website is a version of your website that displays comfortably on a mobile phone or tablet. Most websites don’t render correctly on a mobile device as the screen is smaller and their site was designed for a larger PC screen. For example, the table59 website is mobile friendly (if you would like to check it). How to test if your website is mobile friendly? The simple way of course is to view the website on your mobile device, but you can also manually reduce the size of your browser window on your desktop or laptop and see if the website fits in the smaller window. If you have to scroll horizontally to see the website correctly then it is not mobile friendly. How do make your website mobile friendly? If your website fails the test then don’t worry – most websites fail! Chances are that the website was built some years ago before it became so important to be mobile friendly. The question is, what can you do about it? If you would like more practical tips on how to make your website mobile friendly please contact us on hello@table59.co.uk. https://www.table59.co.uk/wp-content/uploads/2013/07/mobileblogjpg.jpg 293 720 Stuart McLean, Founder of table59 https://www.table59.co.uk/wp-content/uploads/2016/03/table59_transparent.275-by78.png Stuart McLean, Founder of table592013-07-05 09:35:202013-07-04 20:34:02Is your Website Mobile Friendly?